When this sprawling, full-floor Tribeca loft at 173 Duane Street first hit the market for $7.95 million at the beginning of the year, 6sqft wasn’t the least bit surprised at its strikingly creative interiors, considering it was owned by artist Merrill Steiger. As we noted, it’s the same building where prolific sculptor Richard Serra has lived and worked since the 1990s. At various points, he and his wife Clara have purchased the first, third, fourth, fifth and sixth floors of the early 20th-century cast-iron building, most recently paying just under $4 million for the third floor in 2011. This left only the second floor out of their hands, but LL NYC reports that Serra has just coughed up $7 million for Steiger’s unit, giving him ownership of the entire building. The interiors at this jumbo Tribeca loft are a work of art even at first glance; that’s likely because the 4,223 square foot home at 173 Duane Street is currently owned by artist Merrill Steiger, who bought it in 2008 for $3.85 million. Incidentally, the two-bedroom loft co-op is also in the building where sculptor Richard Serra has lived and worked since the 1990s. 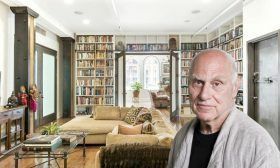 Serra, who is known for his large-scale site-specific works, has at various times purchased the first, third, fourth, fifth and sixth floors of the classic early 20th-century cast iron building with his wife, Clara. 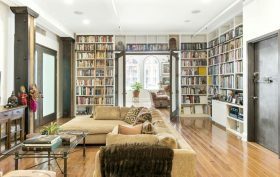 The sprawling second floor apartment with a separate art studio is currently listed by Steiger for $7.95 million.